It was a satirist’s job to provide humorous, and often biting, commentary on all the subjects of the day. Because health issues were so prevalent and Britons were so obsessed with health, the caricaturist found a wealth of material to use in examining disease, illness, medicine, and unorthodox healing methods in nineteenth-century Britain. The general public could easily identify with the medically-related cartoons the satirists produced; who hadn’t felt sick, experienced the side effects of the popular medicines, or grown frustrated with the inefficacy of medical treatments and the high cost of medicine? 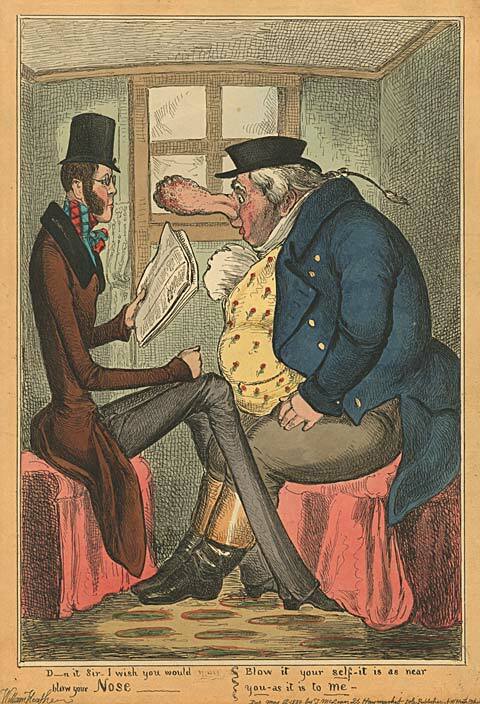 With wit and cynical observation, the caricaturists elevated health issues to comical proportions, and the laughter their cartoons generated helped allay the public’s anxiety over their physical well-being. Very Ill! Anon, published by J. L. Marks, 27 Artillery Street, Bishopsgate, London. Most Britons could relate to the suffering of the individual in this satire. The artist conveys the ravaging effects of illness by drawing haggard lines and a frown on the character’s face. 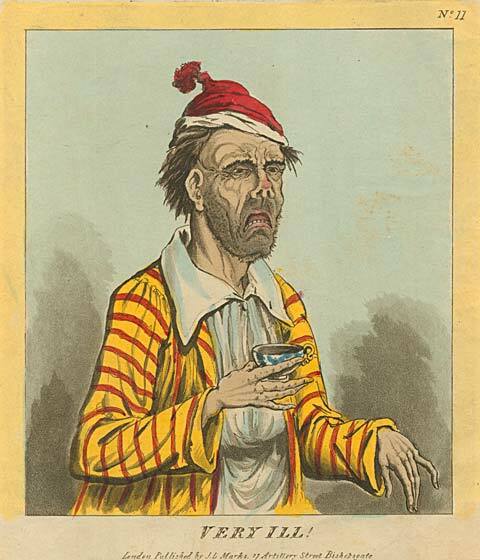 The man is so sick he remains in his nightclothes, and the stubble on his face indicates that he has been ill for days. His long limp fingers hold a cup of tea that may or may not restore his health. D_n it Sir, I wish you would blow your Nose. William Heath, published by T. McLean, 26 Haymarket, London, May 12, 1830. 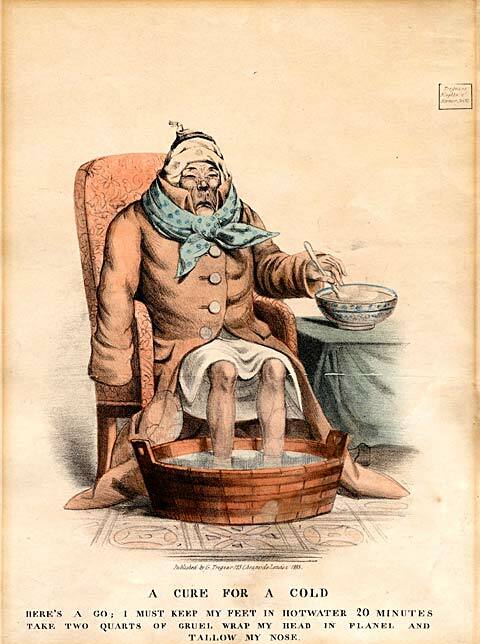 A Cure for a Cold: Here’s a go; I must keep my feet in hotwater 20 minutes Take two quarts of gruel wrap my head in flanel and Tallow my nose. Anon, published by G. Tregear, 123 Cheapside, London, 1833. Buchan doesn’t mention rubbing tallow, an animal fat, on the nose. Perhaps tallow was thought to assist the opening of the sinus cavities and provide relief for a stuffy nose. Head Ache. George Cruikshank, published by G. Humphrey, 27 St. James’s St., London, February 12, 1819. Another common technique of satirists was to blame physical suffering on sinister beings. Goblins, demons, and imps were drawn as energetic creatures that relished inflicting pain on humans. 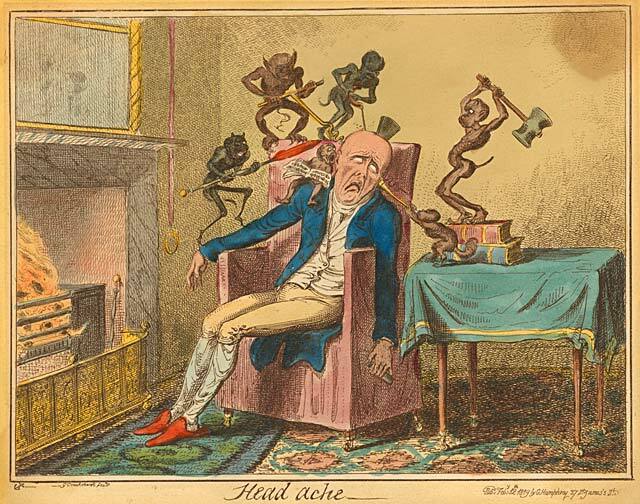 In the 1819 caricature by George Cruikshank entitled “Head ache,” six demons are the root cause of the main character’s misery. The victim’s excruciating headache, perhaps a migraine, has left him weary and lifeless as he sits in a chair in front of a roaring fire. His head hurts so badly that his eyes have rolled back into his head, revealing only the whites of his eyes. With gleeful enthusiasm the devilish characters are working hard at their gruesome task. A demon swings a large mallet to drive a stake into the man’s skull while another drills a terrifying corkscrew device (an enlarged version of a trephine instrument) into his head. In a previously made hole, another demon pours a liquid substance into his brain. Yet another stands on the man’s arm ready to strike with a spear. Cruikshank amusingly captures how noises can further intensify the trials of a headache sufferer by drawing an imp, sitting on the tortured character’s shoulder, obnoxiously singing into one ear while another imp blows a horn directly into the other ear.